It’s time to take a break from that constant city clamor and fall asleep to the sound of tumbling waves and the hum of summer cicadas. Just east of Breezy Point and west of Jacob Riis, Fort Tilden is the big patch of green on a map of the Rockaway peninsula and is part of the Gateway National Recreation Area. The raw textures of the area – dense greenery and rolling sand dunes, interspersed with abandoned military structures and art installations – offer visitors plenty of room to roam and create their own beachside adventures. 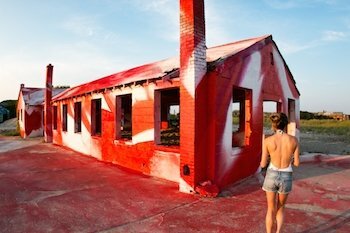 Fort Tilden is a diamond in the rough and now visitors have the unique opportunity to sleep there. 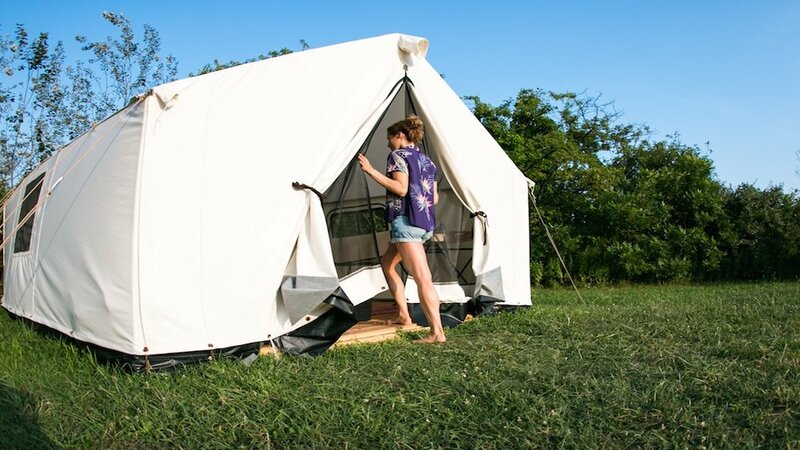 We got a first-hand look at Terra Glamping’s Fort Tilden pop-up and we recommend it to our city-based readers who are aching for both nature and R & R. It’s not often that you can get that far away feeling so close to the city. The Terra Glamping camp includes 5 safari-style tents, with unexpectedly soft memory-foam queen beds in each. If the crickets don’t keep you up at night, you will surely melt into the soft sheets and sleep well. Great weather is ideal, but the camp is fully functional in the rain, as tents are weather-proofed, local dining options are open, and you can still swim in the rain. Reservations include a continental breakfast of yogurt and pastries served daily. In the communal space you will find all the comforts of the living room you wish you had, just set up outside. Plus, there’s a fire pit that guests gather around nightly for s’mores and storytelling. 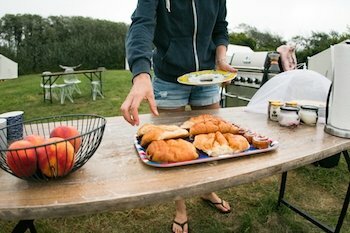 For lunch and dinner guests can dine out (tons of options are within walking distance) or cook in – a gas grill, plates, cutlery, and coolers for food storage are available. Remember, this is glamping (glamorous + camping = glamping), so you can camp under the stars and have a hot shower too! There are shared bathroom and shower facilities – bath towels, body wash, shampoo, and conditioner are provided. You will feel off the grid, but you will still have enough service to upload your photos (#glamping) and a charging block for your phone. The campsite offers some programming on weekends – like morning yoga, impromptu live music at sunset, and a hammock to kick back in – but you will spend the majority of your time exploring offsite. There are endless summer activities to do within walking distance! Rent bikes, kayaks, and standup paddleboards with Wheel Fun Rentals. Get in touch with nature on a Whale Watching and Dolphin Adventure Cruise (open Wed-Sun), or climb to the top of the Battery Harris East Lookout for the best birdwatching in the area and a 360 degree view of Jamaica Bay and the ocean. 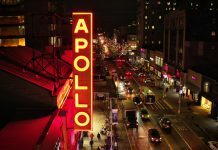 Explore the local art scene and check out MoMA PS1’s nearby art installation, then head to the Rockaway Artists Alliance gallery space to see the latest exhibit. 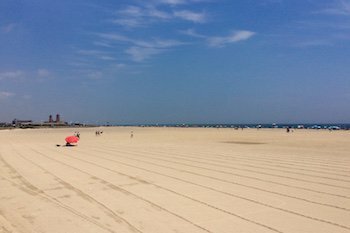 Later on, retreat to the beach with a book and take a dip (no lifeguards are on duty here, so head to Jacob Riis Beach with the kids). Riis Park Bazaar transformed a historic Jacob Riis National Park building into a year-round hip hangout. 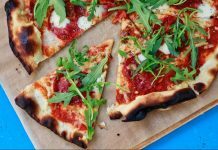 They offer an expansive outdoor market all summer long and an eclectic array of pop-up eateries – no need to dust the sand off your feet before shopping or dining. 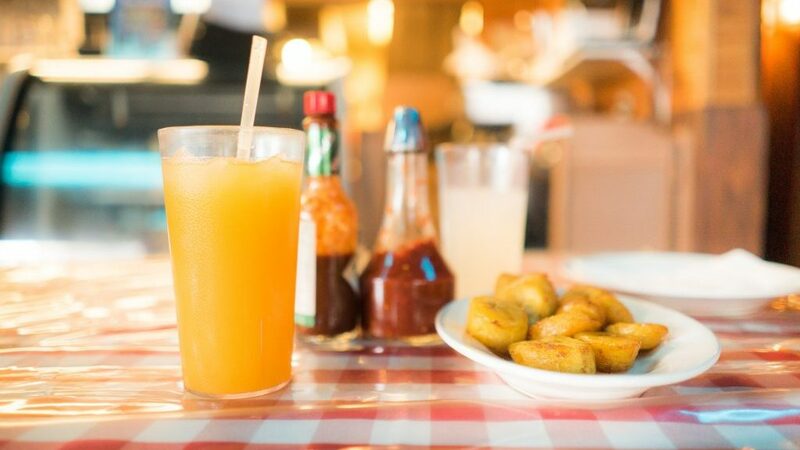 Try the fresh ceviche at Rockaway Clam Bar (an offshoot of Red Hook Lobster Pound), crisp cone fries tossed in thyme salt and parsley at Bolivian Llama Party, or an organic chicken shawarma and other warming middle eastern bites at Samesa. Finish off a hot beach day with homemade ice cream from Ample Hills Creamery or a dairy-free frozen coconut mousse by Mud (a local favorite). Between campfires, outdoor movies, and live music, it’s always a party at the Riis Park Bazaar. Fort Tilden is easily accessible by public transportation: the Q22 and Q35 buses; the NYC Beach Bus from Manhattan and Brooklyn; and the New York Beach Ferry to Riis Landing ($20). We recommend taking the NYC Ferry ($2.75), then hopping on the free shuttle to Jacob Riis. If you pack light, Fort Tilden is accessible by bike too. Terra Glamping is only open until mid September, so book your stay soon. 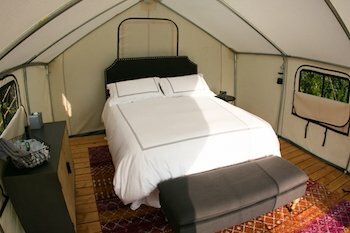 Tents are $200 Sun-Thurs, $225 Fridays, and $250 on Saturdays (two-night minimum on weekends). 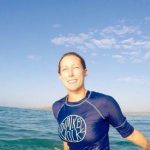 Here are a few things we’d recommend packing: swimsuit, beach towel, binoculars for bird and whale watching, eye mask and earplugs for a deeper sleep, water, reusable plates and cutlery to reduce waste.